Welcome to the New SepiSolar.com! Welcome to the new SepiSolar website. Here’s how we listened to you. If you’ve ever been to SepiSolar.com for design and engineering services, you’ve probably just noticed that our website has changed–a lot. Why did we redesign our website? Because we listened to you, our customers and potential customers, who wanted a better user experience. With that in mind, here’s a brief tour of the new SepiSolar website with some highlights of what’s changed. We’ve heard from you that extra clicks mean extra time finding the exact design and engineering services that you want. To improve navigation and user experience, we made all of our core services visible on the home page. 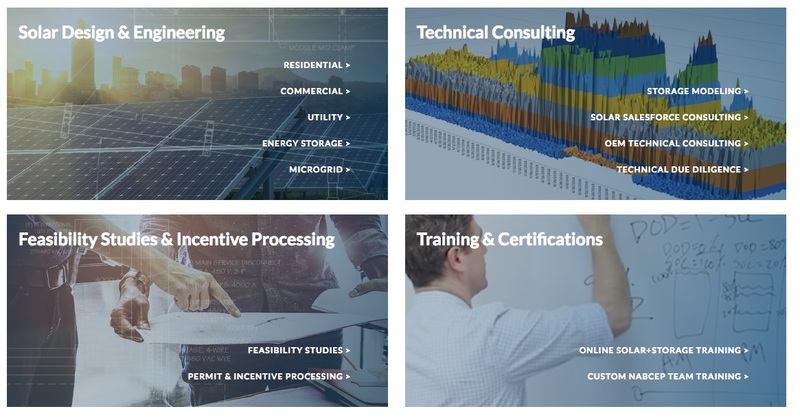 With one click, you can now learn more about, say, our commercial design services, or energy storage.  The home page also has direct links to information about or our various technical consulting services, administrative services, and SepiAcademy, our new online training platform. Still can’t find what you’re looking for? Use our search windows at the very top and in the blue footer of the website. SepiSolar website visitors often never knew they could download sample designs, site survey checklists, and more. To make these assets more visible, we now have “Resources” on our main navigation bar. 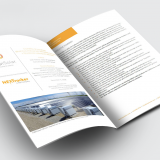 There you’ll discover that we’ve added utility and microgrid design examples, as well as find pages for SepiSolar case studies, white papers and finished project photographs. 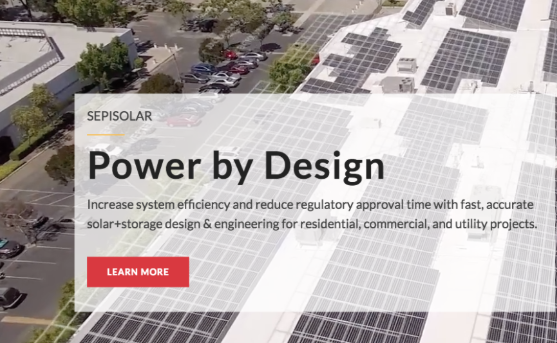 As you’ll see in our About page, SepiSolar’s mission is “to build a community of designers who care about solving tomorrow’s energy problems today.” We take that mission seriously, so the new website reflects that in several ways. First, we put a face to the designers and engineers and staff that you often speak to. You can also read some of our engineer’s thoughts on the home page, as well as get to know them a little better via our team page, another new section of the site. You’ll also see quotes from our customers and why they use SepiSolar for their design and engineering services. Blogs will also be more personal and written by specific team members, not a nameless admin. Finally, you might also notice a new FAQ button on our website. These are all general questions that we often here, but you’re always welcome to contact us directly for your personal question. If you’re new to SepiSolar and need a quote for design or technical consulting, well, there’s a big orange button in the top right of every page. There you can register for our SepiPortal and get a fast estimate for one or several designs. Already registered? Log in, as usual, using the red SepiPortal button at the top right of every page. It’s always a team effort here at SepiSolar, but I have to give a special shout-out to Lean Digital Systems, our web designers. 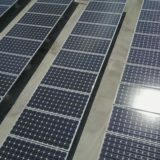 If you love this website, we’re confident they’ll create a beautiful, personal, and user-friendly solar website for your solar or energy storage company too!